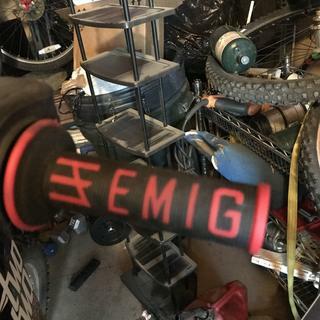 When multi-time AMA MX champion Jeff Emig wanted to revive his family brand EMIG Racing, he went to ODI to develop a new MX hand grip. After being introduced to the new V2 Lock-On Grip system, Jeff immediately saw the benefits of the new technology. In addition to the ease of installing the lock-on grips, Jeff found that there were larger benefits as well, such as a new smooth dirt bike throttle tube with every new pair. He put his own custom design to the V2 system lock-on grips to develop "the best grip for racers on the planet." It’s not often new technology replaces a conventional standard. The Emig V2 Lock-On Grip System by ODI allows you to change hand grips in minutes with a 100% slip-free guarantee. Tested and proven by Jeff Emig, the V2 lock-on grips deliver pro-level feel, performance and style. 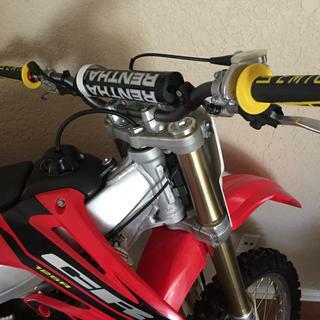 They're the grips that will help you handle your dirt bike like the pros. The throttle lock-on grip is molded to an OE-spec throttle tube, which means you get fresh, perfectly smooth throttle operation. 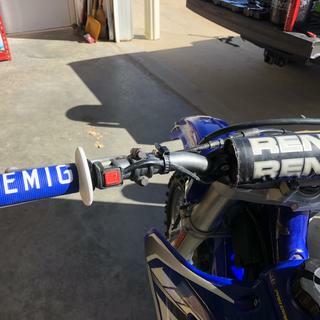 The V2 Emig MX Lock-On Grips are available for 2-stroke and 4-stroke dirt bikes, with multiple throttle cams included. A locking collar secures the clutch side grip to the handlebars. This eliminates the need for glue and wires and makes it possible to change grips between motos… even if you just want to try a new color. ODI V2 Emig MX Lock-On Grips offer 100% slip-free performance guaranteed. The lock-on grips feature simple installation and removal without waiting for grip glue to dry. The throttle tube is included with the snap-on cam to match more dirt bike models. The grip ends knock out to easily accommodate handguards. No safety wire required means longer grip life, even in the event of a crash. The medium-diameter knurled pattern EMIG design includes specially designed half-waffle pattern with thumb relief. I have been using these grips for some time now as this is my third set, and all I can say is they are durable, easy to install, and have no discernable play in them once installed. Overall they are a great buy in my opinion! I LOVE not having to deal with glue and safety wire. These were pretty easy to install...they have little punch outs at the ends if you run full wrap around guards. However, none of the included throttle cams seemed to fit my bike. One was close, but it was thick enough that it did not turn freely inside the throttle assembly. I went with one of the thinner cams, but then the throttle had some lateral play back and forth. I don't really notice it while riding, but it was a little annoying at first. Great quality, easy to install, look great. Good feel to them. Really easy to install. Not sure how well they will isolate vibrations as the rubber is thinner. The emig lock on grips are the best grip in the world. They are very comfortable and durable. I have had them for a few months and still not a tear in them. They never give me blisters when i am not wearing gloves and have great feel to the hand. These grips are outstanding! Fit great good price.color matches great very happy with my purchase. I love this product. I put them on every bike they will fit. It’s so nice not messing around with glue or wire! Having a nice fresh throttle tube is nice too. No more worn out beat up tubes that need replacing frequently when you have a good spill. Instructions tell you which cam to run for your bike, installation couldn’t be any easier. A little firmer compound so they last a long time. Comfy. These are really nice grip and it is great to not have to glue or wire tie them. Great price here at rockymountainatvmc for it too. No longer need a factory throttle tube as these grips have in installed. You just need to install the correct throttle cable cam and the grips come with a sheet to tell you which one to run. Super simple and look really good. they last the whole race session. Love these grip! Super easy to put on! No glue needed for installation ! 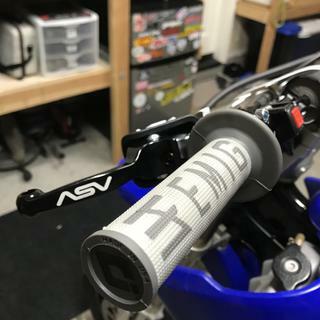 I have been wanting these grips for a very long time finally got them and they are awesome easy to install them and look great would recommend them to anyone great design. 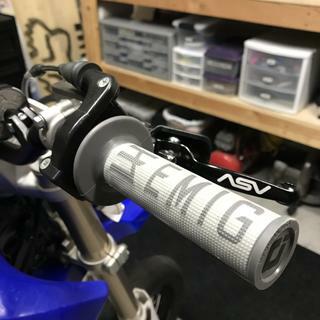 I really like Emig MX grips. I installed them on my WR450F and they are super comfortable. The best part is how well they are designed to work with bark buster guards. I will only buy Odi V2. They helped bring a better look to my bike with some style and managed to go on extremely easy. Already had my buddy buy some for his bike. I’ve only written a few miles on them but I really can’t complain I love them they look great and feel great JUST GET EM!! Great set of grips. All fit perfectly. Grips are great but will not slide over the rough cut left side of the bar. Very easy to install look and fills great. These are hard as a rock. Some people might be able to deal with it, but i prefer cushier grips. Super simple and durable grips. Definitely my go to. Very easy to install and very comfortable for my riding style. Worked great and looks great. Throttle side was easy to install. The left side was a little harder than I had hoped, it was pretty tight trying to get it on but it won’t move now which is great. Well made great looking grips. A nice variety of colors to choose from make it nice to accent your bike anyway you want. Fast easy shipping from RM is handy as well. Crazy Fast Shipping and Service! I received amazing service and crazy fast shipping with my grip order! RM has an awesome selection! I love the way I can save my bike info and lots more in my profile! The video reviews from Chase in the gang are huge too! Lots of insight on tons of products! I’ll be ordering lots more from them soon! Awesome product that’s easy to install and looks sick! Plus, they feel and work great! I like these grips been using them for a few rides and they seem to be comfortable and wear good. Got these as gift from my mom. I have a set on my 2002 CR250R and they are awesome. This pair is for my Supermoto Mini and again I’m super satisfied. I honestly try to put them on every bike I own. Easy install. Don't know why manufacturers don't sell with the throttle tube cut out for bar clamps. Never seem to do a good job myself, always ruff lookin. Anyways, seems like a decent product, have to check the locks periodically. I was using pillow tops but after riding all day I was getting sore spots on my palms. Not anymore with these grips. They are thin feeling and I have smaller hands but I did just switch from pillow tops. The waffle is flexible and doesn’t cause your finger tips to get sore. I didn’t have any issue losing grip in any conditions. Had to tighten the heck out of clutch side grip. Looks nice though. I recently crashed on my bike which destroyed the right grip and throttle tube. Instead of buying a new throttle tube ($7) plus another set of grips $15-$20, I thought I would give these a try. They come complete with the throttle tube and grip for the right side and a lock-on grip for the left side-no need for glue or safety wire which was plus. I actually ordered 2 sets 1 for my '16 yz250f and 1 for my '99 yz250. I was surprised as they were both the same part number, but they came with an assortment of cams to fit both models. I went with the blue/white and they look sharp. Now the only trouble will be keeping them clean! I love that this is a lock on grip so there is no chance it spins. They are a little larger than some other grips and feel better in the hand. Super grippy compound and they are tough so they don't rip if you ever fall. Very long life span as well. I love these grips and I use them on all my bikes. Super easy to install and they stay on tight. Love these grips. Hold up very well. A bit hard to install but worth it. Awesome grips. Easy install, no glue, no safety wire. These grips are nice. Strong and don't spin like glue ons. I know every 17 year old wants these on their bike because of the look but I acctually like the performance. Not too bulky and hold up well to off road riding. My KTM rarely sees a track but I know I'll look the part. Only the blue and the black Emig V2 grips are shown with the cams for a 4 stroke throttle. And when I ordered my Orange V2 grips they came with cams that would ONLY fit a 2 stroke throttle. Do ALL colors of the V2 grips come with 2 AND 4 stroke throttle cams or only the blue and black? Do you have to have specific bars, or will it work on most bars (Renthal, pro taper)? BEST ANSWER: No, you do not have to have specific bars. These will work with most handlebars. However, if you do purchase these grips and you have Pro-Taper bars, they do have a larger knurling (the rough part of the bars where the grips sit) compared to most bars out there, which sometimes require the knurling to be brought down. The best way I have seen the knurling brought down is with some sand paper or a light duty file. You do not need to remove much to clear the lock rings but it should sit pretty flush with the smooth part of the bar. Any problem cutting off the ends for barkbusters? No, you cut part of the end of the grip off and then knock the plastic end out with a screwdriver. Best grips out there. No problem cutting off the ends for barkbusters, I just used a box cutter with a new razor blade in it. I have never used with bark busters. However I don't see why it wouldn't work. No problems I just used a Razor knife and managed to not cut my self. None what so ever, they have a punch out for the hand guard inserts. Nope, they are made to cut off easy! Has anyone used these with the chub bar? I'm wanting to do a full bar swap on my 2014 KLR and I'm curious if there is anything special that I might have to do other than "plug and play"? BEST ANSWER: There's no special step you have to take to install these grips on those bars. They bolt right up. 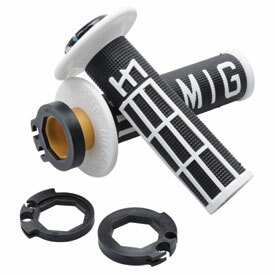 Have anyone have any problems with the ODI Emig V2 Lock-On Grips? BEST ANSWER: These grips are about as good as it gets for durability and performance. You may be able to find something that is better at one or the other, but not both as good as these. The locking mechanism is very nice because you can take them off, if you'd like to try different bars or shorten your bars. No problems at all. wear and tare that every grip receives but thats it. These hold up just as well if not better than others. I highly recommend them. several of my friends are using these now as well. The problem I had was when I was installing the throttle grip, the kit didn't come with the correct cam to fit my throttle housing. But I made it work by modifying the closest fitting one. They were the easiest grips I have ever installed. Had them on in under 5 minutes and they are holding up great. The fresh throttle tube is a nice bonus as well. I have had mine for a couple years (2ish) and the only problem I have had is dirt making them look funny. Haha. I love them and suggest them to all my friends. No, I love them and will never go back to any other grip. They are eaiser to put on and take off. I've bought 30 plus sets and have yet to have a problem! I had zero issues with mine. Actually had one set on woods bike with wrap handguards and another set on mx bike. Will purchase again once worn out. I had to file the inside a bit to get mine on. They were tight but as soon as I got the edge filed down, they slid right on nice and snug. No at all. These truly are the best grips I have ever had on a bike. Easy to put on and they DO NOT SLIP. NO GLUE, NO WIRE, awesome. No problems at all. For me I prefer the Rogue model. Has a little more comfort vibration wise and a little more "grip" if you will. No problems at all. Easiest to install no waiting for glue no wires it great. will never go back. Nope. I'm on my 4th or 5th set of these grips. There super easy to install and last a good while. Some bars require sanding down the knurls for the left grip to fit. These ODI grips are great. I won't go back to glue on grips. Will these work on a ttr 125? I dont see why they wouldnt, but wanted to ask. Just be sure to use the 4 stroke cam for throttle side as noted in the directions cams are stamped with a letter to specify use. will any grip work with this or only Odi grips? 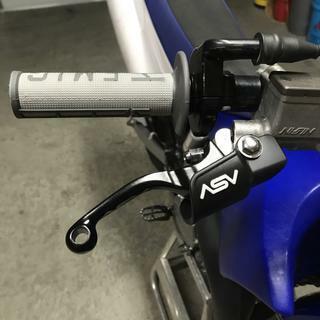 BEST ANSWER: The Odi grips come mounted on the throttle tube and a metal sleeve on clutch side, the main purpose of these is to never have a grip slip on you you just slide them on attach the throttle housing and tighten a screw on the left side to tighten to bars to ensure a solid grip. These grips are not just rubber that gets slid onto the bars. That is why they cost more. These grips are like a throttle tube with a grip. So when the grip needs replced, you unscrew the grip, and replace the whole thing. Not just the rubber. Hope this helps. These grips are a complete unit. Nothing else is needed. 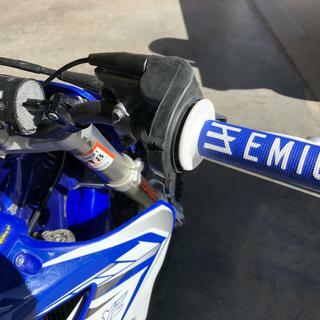 Just select the proper throttle cam for your bike and snap it on in the right position so your Emig logos line up in the orientation you want them. These are the grip. They just slide onto the bar and clamp on. And on the throttle side it replaces your throttle tube. They are really nice. Only the Odi grips. They are one piece that slides onto bars and then tighten Allen wrench screw. They really work well, no slipping. The odi grips that come on this are permanent, and do not come off. The grip comes glued on already. They are lock on grips. Are these melted on grips like kawasaki does? BEST ANSWER: No. They are not melt on. The grip comes with the throttle tube right and fixed tube left. They lock in place with the inner ring that has a set screw. I think they work great. Fast and easy. Im not sure if there glued or melted on but I can tell they have not moved at since I have been using over the last year. Andersen - The rubber grip material is chemically bonded to the plastic tube that acts as the OE Replacement Throttle Tube on the Throttle side, and is bonded to a slim sleeve for the clutch side that has a lock ring that is attached to the plastic sleeve, and locks the grips into place. They feel just like traditional slide on grips once installed!!! No they are bolted on. There is a metal pinch ring tightened by a Allen head bolt. They lock on and leave no residue. Is one color grip a softer compound than the others? No they are all the same. The compound is about the same as concrete. Get ready for blisters. They shouldn’t be if it’s a different compound it would say. No all the same just different color. Will these fit my 2005 RM85 with stock bars? Will these fit 7/8 bars? BEST ANSWER: The grip size is the same for 1 1/8 fat bars and 7/8 bars. Make sure you get grips listed for your bike because the interchangeable throttle cam is bike specific. All grips are designed for 7/8 bars. On oversize bars only the center section of the bar is oversized not where the grip sits. Will these grips fit my 2015 ktm 85? I bought the bike used with these grips on them but it says on the website that these grips wont fit on my 2015 ktm 85. HELP! BEST ANSWER: We have used them on our KTM 85s for the last couple years. They come with both cams just pick the correct one and bolt them up. Yes these will fit your 2015 KTM 85. You will need to use cam "D" which is provided in all of the 2-Stroke kits. To my knowledge it should be fine. They are nice grips! Well this fit 7/8 bars? BEST ANSWER: Jonathan, yes these are designed to work with 7/8 Handlebars. Just be sure to check the application chart, to ensure it fits your bike as well. BEST ANSWER: The cable end that connects to the twist throttle wont be any different than stock. It's a custom length cable from lectron is all. My 14' 250 xcw had no issues with the stock twist. As long as the Emigs didn't come with a custom cable then your fine. Does this come with a throttle cable ? will these fit an 05 crf 230f. 7/8 bar? BEST ANSWER: These are not listed to fit that machine. on other websites it says these fit my bike (2005 kdx200) but on here it won't even give me the option to select my bike so I can't add them to my cart, I'm planning on ordering Tusk D-flex bark busters and protaper SE bars with this so I don't have to order separate and I can only order off of here because I can't find another site with all that? BEST ANSWER: The manufacturer does not list them for your machine and therefore we cannot guarantee fitment. I apologize for the inconvenience. 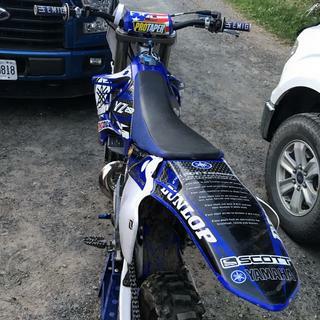 Does these grips fit a 2012 YZ125? It won't show up in the make/model selector, but a 2006 does. How come when I try to choose my 2017 Kx250f it’s not available for this item? BEST ANSWER: Our listing isn't showing it for the 2017. However, if you order them for the 2016 they will come with the same cams you will need for your 2017. I don't suppose these are compatible with grip heaters are they? I mean the heated elements you stick to bar between bar and grip. Or is there a way to do it? BEST ANSWER: Unfortunately these will not be compatible with heated grips due to the lock on design. Will these work with mika fat bars? BEST ANSWER: Yes, they fit on all MC handlebars. Will this work on a 2017 Beta 300 RR? Does the 2stroke version include the cam for the Domino throttle used for the Lectron carb ?